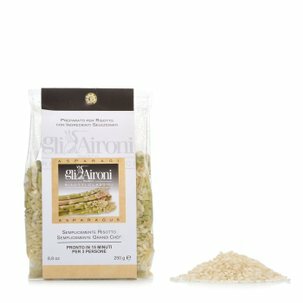 Pumpkin and macaroon risotto is an interpretation by Gli Aironi to recreate one of the all-time classics of north Italian cuisine. Milanese cuisine. This risotto is not precooked, but only moistened with vegetable broth, and then freeze-dried and dressed with pumpkin and crumbled macaroons. It's quick and easy to prepare, created for people in a rush but unwilling to relinquish the flavour of truly delicious and refined recipes. 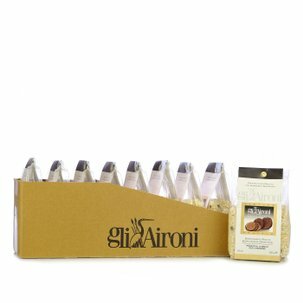 Accompany with a soft and aromatic white such as Sauvignon or a Friulano wine. 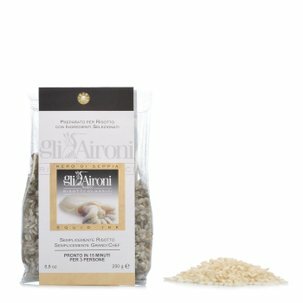 Ingredients Carnaroli rice, vegetable broth (salt, potato starch and maltodextrin, yeast extract, vegetable extracts (carrot and onion), sunflower seed oil, basil, parsley, rosemary), pumpkin, macaroons, salt. Allergens: celery and celery-based products. For more information on product labels, please contact our Customer Service department. The information on the labels of the products may vary for reasons beyond our control, therefore, there may be discrepancies between the information on the site and that on the products delivered. Please always check the information on the product before consumption or use. The experience gained in five generations of rice cultivation has produced its best results in the "Grange" district of Vercelli, where the Perinotti family has dedicated its existence to improving crop conditions on the Tenuta Pracantone farm. 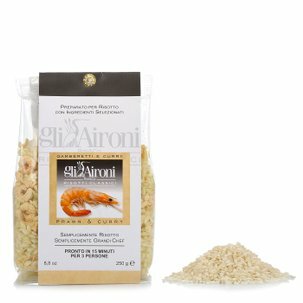 Until a few years ago Italian rice farming was based on high volume production and the indiscriminate use of chemical fertilizers and pesticides, which clearly impacted negatively on grain quality and threatened the very survival of the animal species supporting the ecosystem of the marshlands. Only after the adoption of more gentle farming techniques did the grey herons - once risking extinction - begin to repopulate the rice fields. These are the majestic birds that Michele Perinotti chose as the emblem of Risi&co, which prides itself on its “eco-compatible production model” based on EU agricultural-environmental regulations.